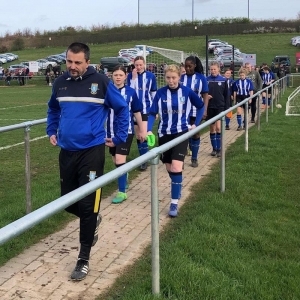 Saturday was Cup Final day as we went for our third final success on the trot, this time up against Doncaster Belles. The game was hosted at Millmoor Juniors who did a great job hosting all the finals on one day. We were able to patch the girls together and have a full squad to choose from. It was always going to be tight with two very good teams evenly matched. Our girls started the game the more dominant with an early chance for Kayha Lea Williams going just over. Belles seized the initiative when a long ball forward caught us out and the Belles player slotted home well. This knocked the girls for a few moments but they remained competitive. Belles doubled their lead just before half time when another long ball caught us out. Half time 2-0 to Belles, a bit harsh on our girls but fair play the opposition with some clinical finishing. We reminded the girls at half time there was still a game to fight for but the fight started to drift out of them when Belles got a third. It was a bit of damage limitation now with Belles being very clinical in their attacking to fire home three more times. It just wasn’t to be our day and this was proved to be the case when what looked like being a consolation goal from Alivia was brilliantly saved by the Belles keeper. Congratulations to all the girls at Doncaster Belles on matching our league and cup double from last season. A tough day but one where many lessons were made which will hopefully stand us in good stead for the future. Our girls are still a great team, just didn’t happen for us yesterday. Well done to both teams and congratulations Doncaster Belles on a great victory.